The Fellowship was fortunate enough to obtain a copy of MEDUSA #1 from Bluewater Comics. The story is by Nick Lyons with pencils by Brandon Hendricks and Carl Riely. 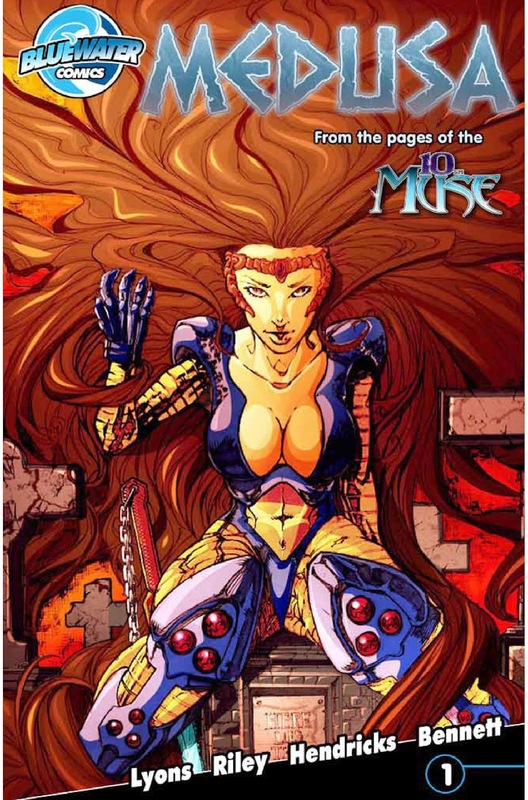 MEDUSA is a spinoff of the 10TH MUSE - a comic that tells of a forgotten daughter of Zeus who becomes a superhero. Meet Gloria Merrick. She accidently cut her hand on the Sword of Perseus, which gave her the power of Medusa the Gorgon. Medusa's sisters Stheno and Euryale are not happy about this development and decide to hunt down and kill the imposter. Can Gloria defeat them or at least convince the sisters not to kill her? I hope MEDUSA will be an ongoing because I am intrigued with the premise. It is rare to have an ongoing series with the protagonist being a villain. While Medusa's story is recounted, there is some potential here with looking deeper into the myth and if Gloria is worthy to handle the powers and the legacy that she has been given. Not familiar with the works of Brandon Hendricks and Carl Riely, but the artwork in the book is good. While I had some minor problems with the dialogue, I definitely would like to see more. MEDUSA #1 is available at www.bluewaterprod.com or at www.comicfleamarket.com.